Glendive is a city in and the county seat of Dawson County, Montana, United States. 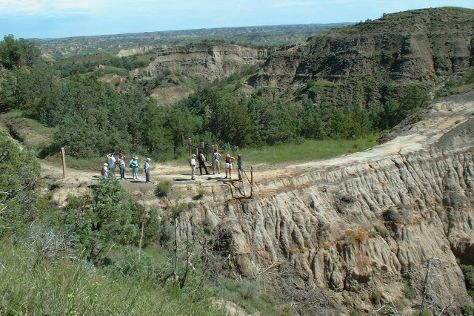 Kick off your visit on the 6th (Tue): learn more about the world around you at Glendive Dinosaur and Fossil Museum and then immerse yourself in nature at Makoshika State Park. For where to stay, other places to visit, and more tourist information, you can read our Glendive tour planner. Dickinson to Glendive is an approximately 2-hour car ride. June in Glendive sees daily highs of 75°F and lows of 51°F at night. Finish your sightseeing early on the 6th (Tue) so you can travel to Dickinson. Dickinson is a city in Stark County, North Dakota, United States. Kick off your visit on the 7th (Wed): explore the wealth of natural beauty at Little Missouri National Grassland. Keep things going the next day: contemplate in the serene atmosphere at Assumption Abbey and then trek along Oxbow Overlook. For reviews, more things to do, photos, and other tourist information, refer to the Dickinson custom trip planner. Traveling by car from Glendive to Dickinson takes 2 hours. In June, plan for daily highs up to 74°F, and evening lows to 50°F. Finish your sightseeing early on the 8th (Thu) to allow enough time to travel back home.